Health Policy, Leadership Development, Nursing And Nursing Faculty Shortages, Writing For Publication. 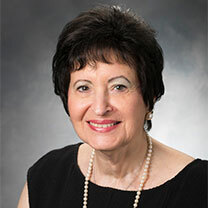 Harriet Feldman was Dean and Professor of Lienhard School of Nursing from 1993 to 2010, when she was appointed interim provost; after a brief sabbatical, she returned to the position of Dean of the College of Health Professions and the Lienhard School of Nursing. From 1987 to 1993 she was Professor and Chair of the Department of Nursing at Fairleigh Dickinson University. She started her teaching career at the associate degree in nursing program at the State University of New York at Farmingdale. From 1971 to 1990, she held faculty positions at Adelphi University, where she was Assistant Dean for Academic Administration from 1984 to 1987. She co-founded Scholarly Inquiry for Nursing Practice: An International Journal in 1986 and served as co-editor until 1997; Dean Feldman was Editor of Nursing Leadership Forum from 1998 to 2005. She is a past member of the Board of the Commission on Collegiate Nursing Education, serving as Secretary (2006-07), Vice Chair (2007), and Chair (2008-2009). Dr. Feldman currently holds the following appointments: Member of both the Substantive Change and Appeals committees of the Commission on Collegiate Nursing Education and the Nurses Committee of the New York Academy of Nursing. She is a Fellow of the American Academy of Nursing, a member of Sigma Theta Tau International and the American Association of Colleges of Nursing, and a Fellow of the New York Academy of Medicine. Dr. Feldman has presented on various leadership and accreditation topics at national and international conferences. She has involved students in a number of publishing and research projects. Three of her 10 books received national awards, focusing on nurses in elected and appointed political positions, educating nurses for leadership positions, and evidenced-based practice. Her most recent book, “Teaching Evidence-Based Practice in Nursing,” co-edited with Dr. Rona F. Levin and published by Springer, came in second place as an American Journal of Nursing Book of the Year Award. While at Pace, Dr. Feldman has been the principal author or co-author of grants totaling more than $3 million. In addition to her published books, she has more than 80 published articles. She has received numerous awards for her work in political advocacy and her leadership in higher education. The award recognizes a nurse educator who significantly influenced nursing education by creating innovative and humanistic approaches to teaching. On the heels of the announcement of President Trump’s proposed federal budget, the public is beginning to visualize what the world may look like after the Trump administration is through with it. Those of us in the health care industry are concerned for the future health of an already aging and ailing population.